We welcome you to join us for worship and Bible teaching each Sunday. We sing the traditional hymns of the Faith and celebrate the Lord's supper each week. We are a friendly and welcoming congregation of people seeking to follow Christ's example and draw closer to him in a living relationship. We encourage you to join us. A crèche is available for young children during the sermon. Before the Morning Service, we have Sunday School. There are classes for preschool, primary, high school and adults. Younger classes enjoy singing and craft with their Bible lessons and older classes embark on a more in-depth study and discussion of the principles and practice of God's Word. For those who desire a more comprehensive grounding in the truths of God's Word, Bible Institute is held on Monday nights during school terms. Bible Institute provides a valuable forum for Christians to approach Bible doctrine in a structured and memorable way. Students are able to enjoy the opportunity to discuss questions during class presentations. It has been said that the prayer meeting is the 'powerhouse' of a church. Continuing the New Testament pattern, we meet for corporate prayer every Tuesday evening. After singing hymns, and a short Bible message, we move into groups for praise, thanksgiving and intercession. One Way Club is for primary-aged children and is an evening of excitement and edification. Children enjoy lively games, a snack, singing gospel choruses, a Bible story and discussion time each Wednesday evening during school terms. We always try to have a special night at the end of each school term; like a campfire or make your own cookies. Contact Nathan Searle 0410 494 856 njsearle@optusnet.com.au. Youth Group is for young adults from high-school age and above to meet together for mutual encouragement and exhortation in the Word of God. The program includes regular Bible studies, dinner outings and after-church meals in various homes. Youth Group is held fornightly. On the first Tuesday evening of each month the Ladies meet in a home for Bible study and the men meet for breakfast, Bible study and prayer on the following Saturday morning. Monthly a team visits a local nursing home on Sunday afternoon to hold a Church service with singing, musical items and a Bible message. The nursing staff and residents have indicated their appreciation and enjoyment of this ministry. Camps are organised for the families and youth of the church to 'come apart and rest awhile'. Everyone enjoys some time out from their busy schedules to hear some preaching and enjoy some fellowship together. Each year we travel to somewhere in rural or outback towns to encourage a local ministry. We ususal conduct church services, assist in street evangelism and hold a School Holiday Bible Club for the local children. We have visited towns in New South Wales, Queensland and South Australia. These trips are not only a significant encouragement to the local Christians where we visit, but are a valuable training ground in Christian ministry for those who go. Closer to home, School Holiday Bible Clubs are held in the Summer School Holidays. 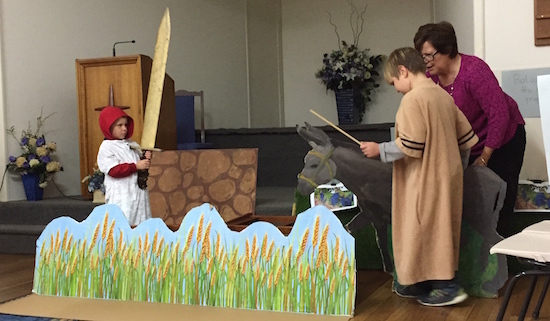 Over a number of days, children enjoy exciting games, intriguing craft, puppet plays, Bible stories and singing.